The characteristics of the conveyed materials and the working environment are different for each application. Many types of attachments are available with or without jigs. Our standard attachments are available based upon the long history of attachment chain usage and demand. Being high quality, economical with a quick delivery to meet customers' requirements. For Single Pitch attachment chain, standard attachments include: A, WA, K, WK, SA, WSA, SK, WSK, D-1, and D-3 types. For Double Pitch attachment chain, standard attachments include: A, K, SA, SK, D-1, D-3 and GK-1 types. With special surface treatments (Neptune™ series or Nickel-Plated). Made of 304 stainless steel or other materials. For lube-free operations (Lambda and PC series, etc.). Attachments with W-designation only differ in the width of the bent or extended part of the link plate. The width of W-attachments is equal to the width of the link plate. The W-type option is only applicable on the four standard attachments: A, K, SA and SK (referenced WA, WK, WSA and WSK respectively). There are no W-type attachments available for double pitch attachment chains. An A attachment is the most commonly used. It has a bent link plate that extends out on one side of the chain, forming an L-shape. It comes with one or two bolt holes, referred to as A-1 or A-2, respectively. The attachment interval can vary (for example, on each chain link, every five links, or two attachments in a series with intervals every four links, etc.). Generally two strands of chain are used in parallel with slats. The attachments are subject to bending force. If they convey heavy objects, have long jigs installed, or receive side loads, twisting force is added to the bending force. Depending on the application, please ensure you consider these forces in your calculations. The shape of the attachment influences the design of the equipment. If slats do not cover the chain rollers, guide rails may be used to support the chain rollers on the return side. This is an attachment made by installing A attachments on both sides of the chain. The attachment is called K-1 or K-2 based on the number of bolt holes on each individual attachment. The attachment interval can vary, same as the A attachment. The top of the attachment is higher than the R-rollers, so slats or jigs can be installed over the chains. Objects can also be conveyed directly on the K attachments. When a wide slat is installed on two A attachment chains, the slats may not be able to support the weight. A chain with K attachments is installed between the A attachment chains to help support the load. When the slats are rigid enough and are fastened well to the attachments, there is almost no effect from bending force to the strength of the attachment. But if the slat is not fastened well, make sure to consider the bending force in your calculation. If long jigs are installed, or the attachment receives side loads, it will be exposed to twisting forces. The return side of the K attachment chain cannot be supported with guide rails on the rollers. The return may be slack or supported in some other way. For the SA attachment, the link plate is extended on one side of the chain, and one or two bolt holes are installed. These are called SA-1 or SA-2 depending on the number of the bolt holes. The attachment interval can vary the same as the A attachment. These attachments may be adapted for use with hooks or slats. The SA attachment is simpler and stronger than the A attachment, and may receive bending and twisting force depending on the direction of the loads. The return side of the chains can be supported by guide rails on the rollers unless bolts extend into the attachment. SK attachments are made by installing SA attachments on both sides of the chain. They are called SK-1 or SK-2, depending on the number of bolt holes on each individual attachment. The attachment interval can vary the same as the A attachment. Usually SK attachments are used with dogs or jigs. SK attachments are strong enough to withstand bending or twisting forces. The return side of SK attachment chains cannot be supported by guide rails on the rollers as can A or SA attachment chains. The return must be slack or supported in some other manner. In this form, one end of the pin is extended. The attachment interval can vary the same as the A attachment. Two sets of D attachment chains can be connected to cross rods, or jigs (such as blocks). The extended pins are subjected to bending and shearing forces. The return side of the D attachment chain can be supported by guide rails on the rollers. A hole is added to the centre of both link plates, to be able to attach cross rods between two (or more) parallel running chains. The attachment interval can vary the same as the A attachment. 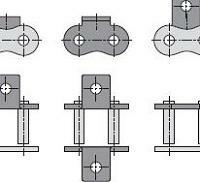 This type of attachment is often used when cross rods with larger diameters than the maximum applicable diameters of hollow pin chains are used. This type of attachment is only available as a double pitch attachment chain, Type R-rollers can not be used in combination with GK-1 attachments due to the interference between the roller and the hole in the link plates. Click here to download an overview of all standard Tsubaki Attachment Types.